I am happy to announce I will be traveling to Sweden to participate in Artscape Saga which is a mural festival in early June. Keep an eye out this summer for the process and finished mural. The provided image is a mural from POW! WOW! San Jose Mural Festival done in October. For the past 95 years, Santa Fe Indian Market has brought together the most gifted Native American artists from the U.S. with millions of visitors and collectors from around the world. The extended weekend of beauty and celebration ranks as the world's largest and most highly acclaimed Native American arts show and as New Mexico's largest attended annual weekend event. 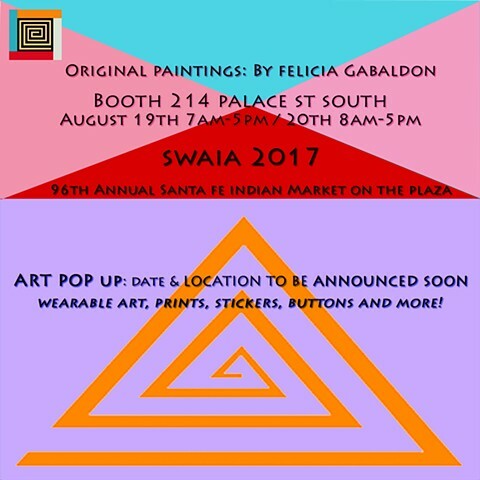 This is Gabaldons' first year as a participant in the famous Southwestern Association for Indian Arts located on the historic Santa Fe Plaza August 19th and 20th. 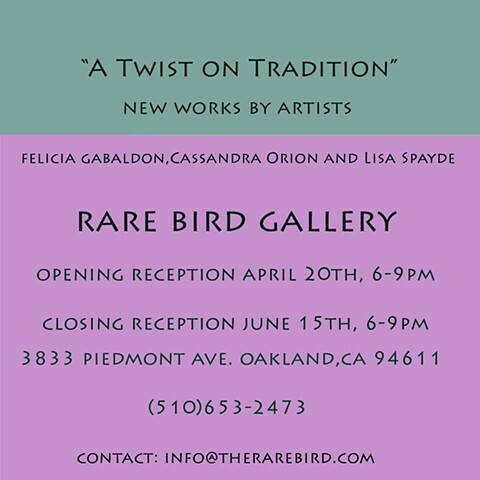 New works by Felicia Gabaldon will showing from April 20th-June 15th in Oakland at the Rare Bird Studio and Gallery on Piedmont Ave. This year’ poster was designed by Santa Fe artist Felicia Gabaldon. Come get a hand signed copy, meet the artist, and get ready for this year’s festival! Only during this event, you can get $100 off of an All-Access Pass for this year’s festival, Dec. 7-11. Come enjoy drinks and bites at the incredible O’Keeffe Museum, support the festival, get a limited hand signed poster and discounted all-access passes! Wonderland SF is a gallery located on 1266 Valencia Street, SF 94110 in the Mission District of San Francisco. This Group Exhibit will be a tribute to Frida Kahlo. The Indigenous Fine Art Market is our flagship venue in Santa Fe, New Mexico August 18-20th at the Santa Fe Rail yard. It's a celebration of native art and the cultures that inspire it. It was born out of a positive movement by artists who want a voice in how their market is produced. Gabaldon will be selling original artworks, limited prints, zines and one of a kind hand painted denim jackets. Her Booth is #109. Alongside participating for a 2nd year Gabaldon will also be showing in a Native Arts Group Exhibit on 830 Canyon Rd at the Beals & Co. Showroom. "Transitions in Traditions," will open August 20th 5-7pm. 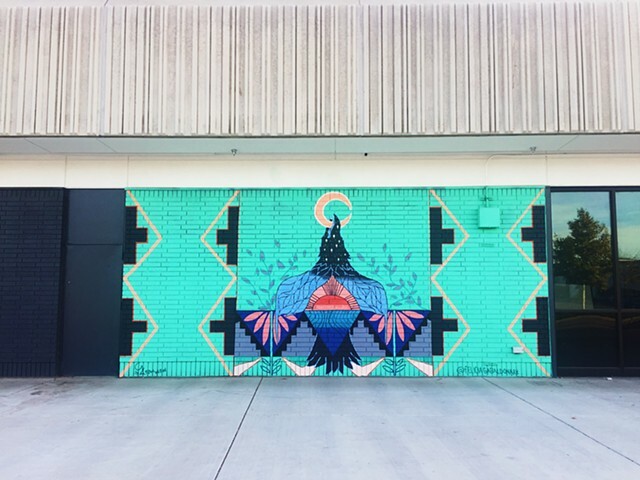 IFAM is a celebration of native art and the cultures that inspire it. It was born out of a positive movement by artists who want a voice in how their market is produced. IFAM is a juried art show and will include only the highest quality artwork. IFAM is about sharing the Native narrative with the world through the connections and relationships made with those who experience our art. IFAM’s events and youth, music and literary programs, will create a greater understanding of the complexity and beauty of Native American culture and people as we evolve and exist today. Gabaldon will be showing at Oxtail Gallery in Berkeley, CA. The exhibit will run for the month of June. The opening is June 11th 6-9pm. As of the end of 2015 I am now officially represented by the talented Art Dealer and owner of Bobby Beals and Co. Bobby and his team of art consultants work together to display and curate successful shows in the Southwest including Santa Fe, NM, Scottsdale, AZ and a few other locations. They curate pop up art shows at high end resorts, hotels and galleries. They work to support local artists from well established to emerging. I currently have a few paintings showcasing in Santa Fe, NM. To view or purchase please email: bobby@bealsandco.com. I will be Participating in Group Show in Santa Fe, NM at the Santa Fe Culinary Academy. It is December 18th from 5-8pm. The annual Bioneers Conference is a fertile hub of social and scientific innovators with practical and visionary solutions for the world's most pressing environmental and social challenges. This year the conference has invited Indigenous artists to showcase their fine art. 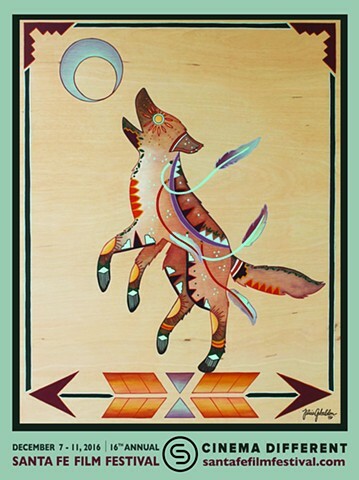 The Pop- Up Art showcase is in partnership with Santa Fe, NM IFAM (Indigenous Fine Arts Market).